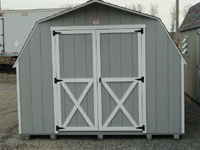 Barn design ~ 2×4 Construction ~ 5′ Double Doors on Sizes Larger than 8′ Wide ~ 1 Window ~ 30 year shingles ~ 16″ Centers ~ Wood Structure – Vinyl siding available at a 20% additional cost ~ Colors can be customized to your specifications. Free Delivery within 20 miles of Hamburg, PA. Call or e-mail for shipping charges throughout the USA.